Performance Improvement 2013-2014. What Are the Service Needs of Current and Former Recipients of Federal Housing Assistance in Memphis, Tennessee? This study analyzed administrative data on public housing residents relocated as a result of local housing redevelopment initiatives in order to assess the service needs, geographic distribution, and service landscape for high-needs populations in Memphis. In Memphis, limited transportation and the dispersion of households away from project-based public housing have made it more difficult for service providers to reach and maintain ties with high-needs residents. An assessment of needs in Memphis indicated that while there are efforts to provide services to this population, they are organizationally disconnected (e.g., city government, county government, nonprofit providers, and public-private partnerships), creating a number of challenges to targeting high-need families and individuals and matching them with available services. 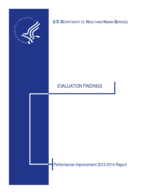 This assessment culminated in a memorandum on promising practices for serving high-needs populations based on evidence-based practices. Specifically, the assessment indicated a significant need for current services, for connection to community providers, and for extensive follow up services for housing-assisted populations in Memphis.